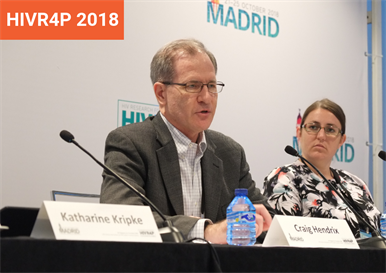 Craig Hendrix at HIVR4P 2018. Photo by Roger Pebody. However, the study also confirmed that the interaction between hormones and PrEP did not appear to go the other way; blood levels of estradiol, the one hormone all of the transgender women took in one form or another, do not appear to be affected by PrEP. The Johns Hopkins study, unlike the Thai study, did not measure hormone levels longitudinally before adding in PrEP or while subjects were on PrEP. Because some subjects were receiving hormones via injection, they only did two measures of hormone levels: at baseline before PrEP, and on day eight, the day of the last dose. These can't be interpreted as peak or trough levels, but as random 'snapshots' of the hormone level in each person, which would be approximate to a mean level when averaged across the eight participants. Craig Hendrix told aidsmap.com: "When you compare our estradiol concentrations in our study to the Thai study, you'll see our random concentrations are several times greater than the Thai study peak – roughly seven times greater than the Thai peak estradiol concentration." In other words, while there was no sign that PrEP had any effect on the activity of gender-affirming hormones, in 'real world' settings, with trans women on varied hormone regimens, they may have considerably higher systemic levels of hormones than in the Thai study, and these may reduce PrEP levels more than previously anticipated. Differences between the two studies might also be due to the fact that the Thai study only measured hormone and PrEP drug levels in blood whereas the Johns Hopkins study also measured levels in T-cells and in rectal tissue cells – and it is in the latter where the biggest decreases in tenofovir and emtricitabine levels were seen. Shieh E et al (presenter Hendrix C). Transgender women on estrogen have significantly lower tenofovir/emtricitabine concentrations during directly observed dosing when compared to cis men. HIV Research for Prevention conference (HIVR4P), Madrid, abstract OA23.03, 2018.